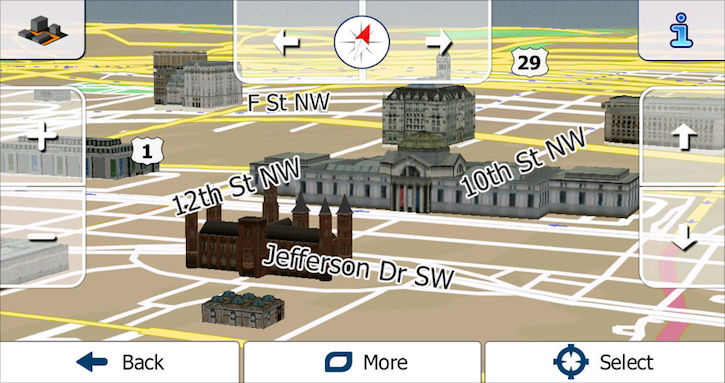 There are quite a few free apps that will fulfill your AppRadio navigation needs. If you're looking for an iOS app with dedicated GPS features, you may want to check out iGo Primo. While there are various iGo Primo apps available based on geographic location, this post is about iGo Primo North America. Priced at $24.99 in the App Store, iGo Primo North America offers various premium features like Offline Maps, AppRadio compatibility ($34.99 in-app purchase), Live Traffic ($37.99 in-app purchase; latest app update says this add-on is FREE), 3D Maps ($9.99 in-app purchase) and Traffic Safety Camera views ($5.99 in-app purchase). The app itself is a 1.8GB download which means the maps are included as a part of the app. No internet connection is required to get directions. These built-in maps will make iGo Primo useful when you're on those long trips through lesser charted areas. iGo Primo app - powered by the same tried-and-trusted iGo Engine used in millions of GPS navigation devices around the world: faster & more reliable than ever before, with a set of new features for a more intelligent navigation. The maps are part of the application, NO ROAMING FEES; no need for cellular network coverage, no surprises. The app interface has a lot of information. You can even input your car's fuel efficiency information and the app will tell you how much fuel you consume on each trip. There's also a Google Search built-in for POI information. When giving directions though, the interface is clear and easy to follow. The app developers have fixed most of the issues that have existed with previous versions of the app. For example, in-app purchases were not available for iOS 7 users but this issue has been fixed now. Pioneer Electronics has posted a spotlight video about iGo Primo North America. Watch it below. You can download the latest version (v2.5) of iGo Primo North America from the App Store today. Apps for other regions are also available. Just do a search for 'iGo Primo' to find the regional app you need. iGo is way better than Waze when it comes to accuracy. It has a better POI offer and in general has better maps. Especially if you're out in the bush. Waze is fun with the reporting and so but that is not really what you need to find your way. One problem I have with Waze is that when you go to an address it will not point out the house number accurate, it has even directed me several blocks away from the correct place. The speed camera support is good and much better than Waze too. One GPS-app even better than iGO is CoPilot but they don't offer AppRadio support, I've been asking them for it but I don't get any answer. iGo is the best.., , but i need it in Argentina for my Pioneer .., so far ., is out of AppRadio support... same shame to Sygic .., /// anybody knowa if NAVGATE has the same folder arch , like iGo.., so we can add cameras and pois ..etc etc?? ?